Recently I was contacted by a university friend working at Monkee Genes, asking if I would like a pair of their jeans to review on my blog. As some of you may know, I am on the quest to find the perfect pair of jeans, as being long bodied with short legs, I struggle to find pairs that fit me properly, so I snapped up the chance in the hope of finding a pair better than my camel ones that are so far, the best I have come across! Monkee Genes are known for creating high quality unisex jeans in an ethical way, using organic cotton. They don’t use slave or child labour in the production of their products, hence their slogan – No Blood, No Sweat, No Tears. I opted for a pair of their skin fit jeans in the colour plum. The colour stood out to me as something a little different, but I can see it working with both a summer and a winter wardrobe. These are more of a jegging like fit, being skin tight and made of a lightweight cotton for extra comfort. I love, love, LOVE the fit. They are like a second skin and are so comfortable. I’ve had them on all day so far and they have been a dream to wear. The only thing I would have preferred is something with a higher waist, but that’s only a little niggle for me and I can see past that! Besides, these are designed to be low rise, so I can deal with it. I’m already planning on wearing these to the airport for when we fly to Greece in August as they are so easy and comfy to wear, and the lightweight fabric means they won’t be too hot in warm weather. 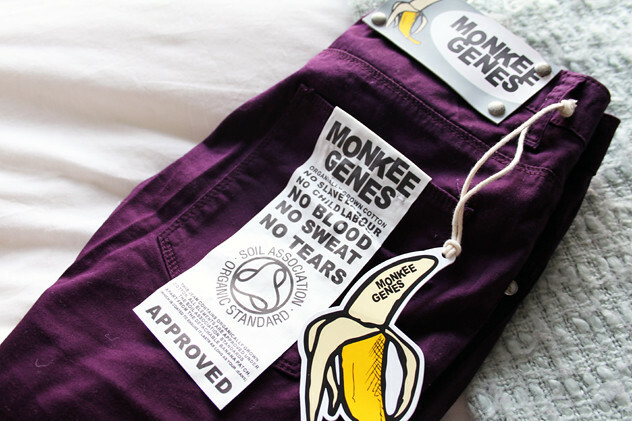 If you like the look of Monkee Genes, then head on over to the website where you can get £5 off with the code FBDISCSHIP11. Go on, treat yourself! I’ve already got my eye on a slate coloured pair too! PS. I completely forgot to post my Sigma brush review last night. I’ll get it up at some point this week! PPS. The giveaway ends tonight at midnight! I have the same Primark top and I had no idea to wear it but this outfit looks great, love the jeans! Ooh they're such a gorgeous colour! I've wanted some monkee jeans for years but never got round to buying any! i flippin LOVE ur necklace .. gotta get me some forever 21!! I nearly bought that tassel top today.. I wish I had now I've seen how lovely it looks on you! Those jeans are a great colour! They really are such a gorgeous colour! Oh, and these "Genes" are awesome!! I'll def have to check out that brand…hopefully they ship to the states! They look not only a great fit but an amazing colour! LOVING THE COLOR OF THOSE SKINNIES!!! The top and the hat paired with it is awesome! 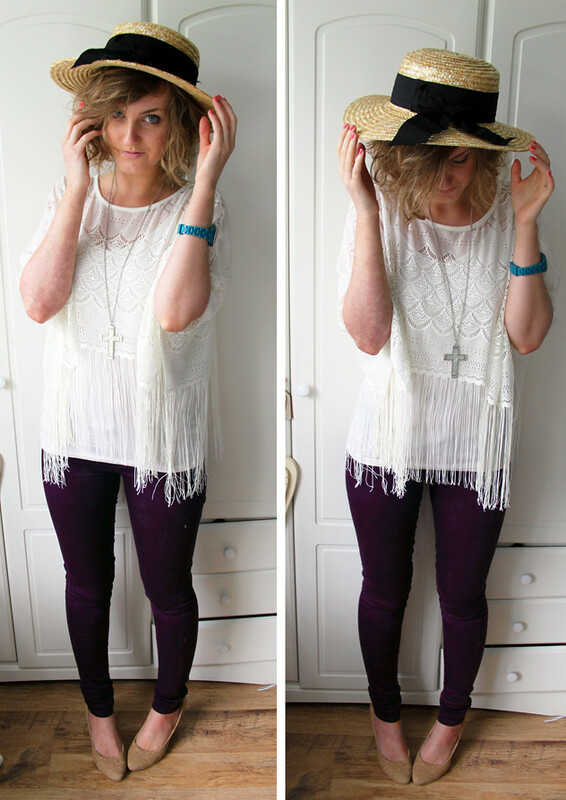 Loving this look, loving your blog! Follow each other?